On Wednesday, June 3 the annual Underclassmen Academic Awards Banquet was held at Emerald Hall in Abington. After eating dinner with their families, friends, peers, and teachers, students listened to the speeches of two Rockland High School alumni both of whom were inducted into Rockland High’s Academic Hall of Fame. Kathleen O’Grady Elliot and Mary Reilly Callahan were inducted into the Academic Hall of Fame on June 3. Fanting Zhou is the grade 11 academic achiever in math and science presented by Guidance Director, Melanie Shaw. Michael Ivanoskos is the grade 11 academic achiever in world language presented by Foreign Language Department Chair, Stephanie Palmer. Thomas Shiner is the grade 10 academic achiever in Pre-Engineering, presented by Science Department Chair, Sam Hoyo. Steven Shorrock is the grade 11 academic achiever in Family Consumer Science, presented by Family Consumer Science Chair, Brenda Folsom. Sarah Kane, grade 10, receives Outstanding Academic Achiever Award for Music. Saoirse McNally receives award for History/Social Science from guidance counselor, Melanie Shaw. Ryan Sugrue is presented with the Grade 11 Overall Academic Achiever Award by Richard Phelps, chairman of the Rockland School Committee and John Retchless, superintendent of schools. Michael Belmonte receives Academic Achiever Award in Mathematics for Grade 10 from Mrs. Shaw. Noelle Atkins receives the Grade 10 Academic Achiever Award in English and Math. Rebecca Elliott, grade 9, receives Outstanding Academic Achiever Award in Mathematics and World Languages from Guidance Director, Melanie Shaw. Guidance Director, Melanie Shaw presents the Grade 9 Outstanding Academic Achiever award in Music and Tech Ed to Rebekah Panaro. 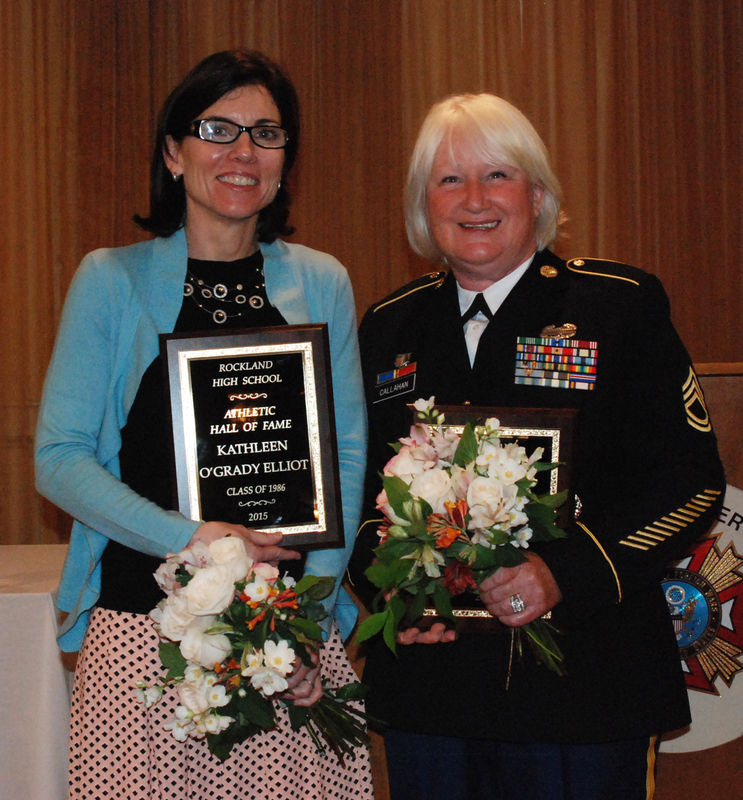 Mary Reilly Callahan, Class of 1974, was inducted into the Rockland High School Academic Hall of Fame on June 3. Members of her family joined her to celebrate this honor. Ronan McNally receives overall academic achiever award in mathematics and science from guidance counselor, Melanie Shaw. Lucas Haas is the grade 10 academic achiever in Music, presented by Guidance Director, Melanie Shaw. Luana Lima is presented with the Grade 10 Overall Academic Achiever Award by Richard Phelps, chairman of the Rockland School Committee and John Retchless, superintendent of schools. Lily Matson is the grade 9 academic achiever in English, Health, and History/Social Science, presented by Guidance Director, Melanie Shaw. Kathleen O’Grady Elliot, Class of 1986, was inducted into the Rockland High School Academic Hall of Fame. Her family gathered with her to celebrate at the dinner at the Emerald Hall in Abington. Julia DiCienzo received a Leadership Award from Asst. Principal Kathy Paulding and Principal Alan Cron. Julia DiCienzo and Jessica Lutts are the grade 10 academic achievers in science presented by Science Department Chair, Sam Hoyo. Junior Haley Macray receives the Journalism Achievement Award from Asst. Principal Kathy Paulding and Principal Alan Cron. Macray is the editor of the Veritas on-line edition. Josepah Campanile is presented with the Grade 9 Academic Achiever Award in Health. Erika Oschenduszko is presented with the Grade 9 Academic Achiever Award for Physical Education by Brenda Folsom. Genesis Rojas receives multiple awards for her academic achievement in music and world languages. Receiving Academic Excellence Certificates and Academic Letters from the Junior Class were Celia Rosa, Joseph Kimball, Michael Ahern, Fanting Zhou and Rebeca Portela. Angela Turner (not pictured) also received an award. Sophomores who received Academic Excellence Certificates and Academic Letters are l to r: Shannon Lindhahl, Sydney Wells, Luana Lima, Lauren Zaremba, Noelle Atkins, Kaylee Patten, Sean Vo, Evan Murphy, Michael McPeck and Michael Belmonte with Dr. Cron in the back. Receiving recognition for achieving High Honors for Three Terms this year were Ryan Sugrue, Noelle Atkins, Sean Sugrue and Luana Lima. Ms. Paulding and Dr. Cron presented the certificates. Lucy Boggs receives the I Dare You Award from Asst. Principal Kathy Paulding. The award is given as recognition of personal integrity, and of leadership. Brenda Folsom, director of technical education, presents Isabelle Uong with the Grade 9 Academic Achiever Award in Technical Education. Art teachers, Sandy Gibson and Cheryl Thompson present Jillian Schofield with the grade 9 Academic Achiever Award. Erika Wiley is the grade 11 academic achiever in music, world language, and history/social science presented by Guidance Director, Melanie Shaw. Haley Macray, multiple award winner for English and History/Social Science, receives award from Mrs. Shaw. Freshman Eden Dalton with her award for Art and English academic achievement presented by Mrs. Shaw. Sophomores Douglas Reardon and Evan Murphy received awards in History/Social Science. Guidance Director Mrs. Shaw presented the awards. Colleen McCarthy receives a Leadership Award from Ms. Paulding and Dr. Cron. Sophomore Colleen McCarthy received the Academic Achiever Award in World Languages presented by department head, Stephanie Palmer. Sophomores Chris McHugh and Erin Buckley receive awards in Physical Education from Mrs. Folsom. Celia Rosa receives a book award for academic achievement from Ms. Paulding and Dr. Cron. Junior Celia Rosa received an Academic Achiever Award in Art and English from Guidance Director, Melanie Shaw. Caroline Kilduff receives Academic Achiever Award in Science from Ms. Hoyo. Freshman Aiden Glennon with Richard Phelps and John Retchless. Aiden received the award for Overal Academic Achievement in Grade 9. Adam Royle was a multiple award winner, receiving the Academic Achievement Award in Family Consumer Science and Technical Education. Presenting the award was Guidance Director, Melanie Shaw.